It's been a very stylish weekend, what with my first book being uploaded onto Amazon through Kindle Direct Publishing, and receiving actual sales. From non-relatives and friends. 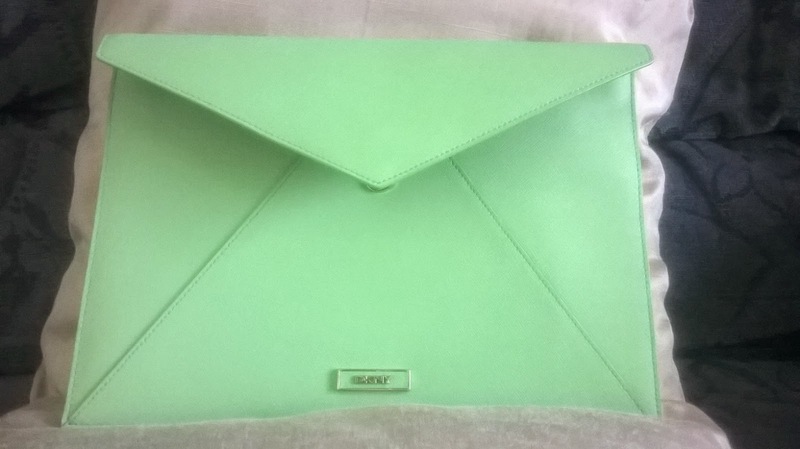 And so I simply had to take advantage of a (flipping well-timed) House of Fraser's bag (and shoe) sale by treating myself to a gorgeous DKNY document holder (55% discount!). For all the drafts of my second book, you see. In lime green and mykinda* pink this beautiful accessory also doubles up as a clutch (not an accessory) - pretty handy for upcoming birthday celebrations. Back to work this morning, however, with a six am start (think I'll reserve the five am geddups for the editing process). I created my Author Pages on Amazon's UK and USA sites, which was more challenging than proofreading my first book. What do you say about yourself, when you nestle amongst other authors? FFS their sample biography was that of multi-award-winning Mr Frank McCourt! (Love his books, though). Still, at least I had my trusty practical guides to assist me, from Sally Jenkins and Steve Scott - their KDP advice is utterly invaluable to anyone fascinated by the publishing revolution, whether writer or reader, and certainly made the process of uploading to Kindle less terrifying. Going to head back to Word now to work on the blank page that is currently book two, attend a few networking meetings this week, write a few guest blog posts and then take a few days off to enjoy the end of August. *I have a rubbish camera phone, and it took me ages to get this shot so not taking another one of the inside - but the pink is the same as my blog's pink and is tres flipping gorgeous. This has now sold out on HoF's website, but they have a the same document holder in black, currently not on sale.